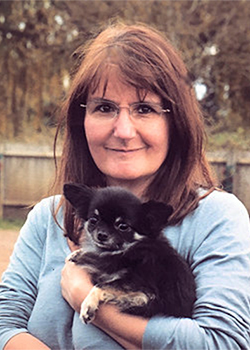 Paulette lives in the beautiful Warwickshire countryside, where she visits the local hospital with her tiny Chihuahuas ‘Mollie’ and ‘MiMi’. Paulette has been our placement officer since 2016 and is our initial liaison between establishments and volunteers for one-off or regular visits. Paulette also wants to stop the rumour that Chihuahua’s belong in handbags!